Bought an Oregon 600 in April 2007 - only paid �120 for it which seemed a bit of a bargain. Took it for 3 weeks in France and Italy in August 2007 and did the job wonderfully. Have used it for 2 weeks in France in August 2009 and will use again in August 2010 in France. Takes less than 30 minutes to put up with 2 people. Can be tricky sometimes to bend the poles into place but the structure is quite robust once pegged in. Had some rain last time we used it and the ground sheet wasn't great in keeping the water out - especially where the door is situated - but probably our fault. Have never used the second smaller compartment so there's more living space for storing stuff, table and chairs etc. The tent survived a 12 month old child last Summer so we're very pleased with it. Hope it will last a few more Summers but will certainly will replaced by another Vango. I have also two other older and smaller Vangos and last year sent an email asking for a replacement storage bag for one of my smaller Vangos and they sent me two bags free of charge - so I'm extremely pleased with the attitude of Vango! Bought a Vango large sun canopy in matching colours - use poles at tent end to prevent any cord abrasion - works fine! One of them went up better than the other one! The wind had calmed a little by the time we put the second up which may have made a difference, as with the first the poles looked a bit of a squashed bow and the inners dint go in very easily � in the end only up in the four person inner and left the other side open as we couldn�t work out how the inner should go! 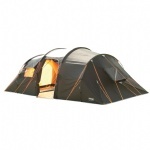 The inner we used on the four man side wouldn�t do up with out straining probably due to the tent being a bit wonky! The other tent we put up did not have these problems. The tents stood up well to the exposed windy conditions on site and rain in the night. The only problem being when the side door is opened water can drip in and run across the tent if you have the ground sheet down. I am not sure about the Vango tensioning system as it creates a triangle across the tent which gets in the way a bit. The only other down side is that there is an option of a end opening door which left a large gap at the bottom when the wind blew � if there was a centre fixing at the bottom that would have been better. We have used this tent for 6 short trips since buying it last year. It's very easy to put up and if it's not windy doesn't have to be pegged in and can be moved around to change position and then pegged! It's lovely and light blue inside with plenty of living space. We have 2 young children and there is room for us all in the 4berth room. Really like the mesh windows and door; and mesh options on the inner rooms were put to good use on midge-infested sites in Scotland. Maybe we are doing something wrong (any ideas?) but the poles all snapped during a windy night in May. The pegs all stayed in. After replacing a lot of pole sections, we had another snapped pole one night in light winds! The last 2 times we've been away it has also leaked. We are going to try the sealant stuff for next time. The 2berth room is very narrow due to the sloping roof. Also found that the inner in the wee room stuck to the outer tent and got wet. Agree with the others about the side door needing a canopy or awning of some sort. Conclusion: Is a good first family tent for us. Only cost �150. We go to some windy sites and so are considering some kind of semi-geodesic or dome with a porch (?) instead of a tunnel. Also, camping in Scotland probably requires a higher rain resistance than 2000. I would buy a Vango again however. Great tent first outing last week in very windy conditions. Just the two of us and plenty room to boot. TBS system helped with the wind, also a wee bit of guy rope tightening. Tent coped well. Only grumble is the side opening door. Instead of rolling back to a side opening, maybe a roll up door would be better as picture shows! this would create a drainpipe effect whereas the side opening allows water to fall inside onto the groundsheet- not good. Altogether a good purchase. Set-up and break down time 30 min either way. Tip - use length of poles as a measuring stick when folding up flysheet as bag is not as generous as it seems. I purchased the Oregon 600 in July 2007 and we have been away in it around 10 times so far. From a week in Oban (with horrendous weather) to camping in glorious sunshine in the Lakes this tent has never let us down once. It is the easiest tent I have ever erected and having been camping for the past 30 years I have put quite a few up in my time! The sewn-in groundsheet keeps all the elements firmly shut outside and the large living area complete with a nice large clear window either side make it a pleasurable place to stay at night. The only thing I could find fault with is the side entrance, being a tunnel tent the door tapers at the top following the roll of the tunnel and if it is raining the inside of the tent inevitably gets wet when you open the door. If Vango could have released a canopy addition this problem could have been solved but they never saw fit to make one. I highly recommend this tent for any families of couples with a lot of equipment. We even took our in-laws with us last year and had 4 adults and 3 children staying in the tent and there was more than enough room and such was the comfort that it changed my sisters opinion (who hated camping) so much that we now all go away together and have planned 2 more holidays away for this year! A great tent at a good price though by searching Im not so sure it is being produced any longer? Add your review of the Oregon 600! Description: Roomy accommodation for a family or group camping from the car. Large living area for storage and domestic duties. 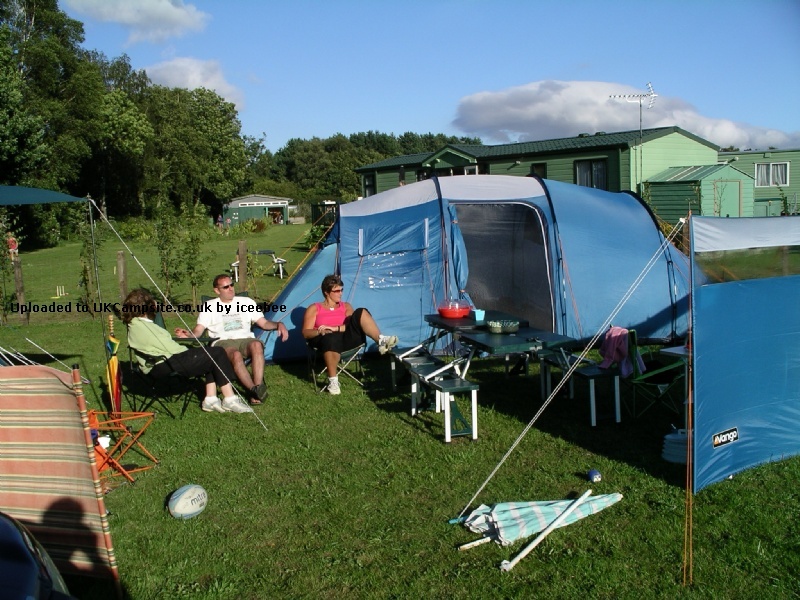 The TBS (Tension Band System) provides enhanced stability for those occasions when the weather is likely to close in or the campsite is a bit less sheltered. Fire Retardant: Flysheet, inner tents, mesh and groundsheet have been coated with a 'Fire-Retardant' treatment to reduce the possibility of ignition from naked flames. Protex 2000 polyester flysheet is durable, totally waterproof and reliable. Seam taped flysheet for long lasting protection. No messy seam sealing. Pitch flysheet first for speed and protection from the weather. Mesh ventilation on inner tent reduces build-up of condensation; keeps bugs out. Colour coded poles and continuous pole sleeves: the correct poles in the correct sleeves make for easier pitching. Bath-tub inner tent groundsheets give total climate protection. 'Crystal Clear' windows with internal covers allow light into the tent as well as outside viewing. Skylight panel in roof allows maximum light into the living area. Front and side doorways give sheltered entry in all conditions. Living area groundsheet and riser groundsheet in the porch area included for additional comfort and adaptability. Zip-entry, handled carry bag makes it quick and easy to pack up and store your tent.